Every fashion season there is always one accessory that designers focus on, and it’s usually to excess. This Fall/Winter, oversized earrings are taking center stage. These baubles are bright, bold and are larger than life. They have fringe, tassels, ridiculous graphics; they may even remind one of the ever-prevalent statement t-shirt craze with witty sayings. This fall, allow your ears to do the talking. I was once told by a silly boy, “The bigger the earrings, the crazier the girl.” ALG prefers, “The bigger the earring, the closer to God.” However, perhaps that is just what we are telling ourselves to justify this fun trend. A statement earring will command attention. It’s an effortless and economical trend to attempt. You can take a fashion risk and step out of your comfort zone without breaking the bank. Accessories like bold earrings and purses allow you to showcase your personality without looking like a fashion victim and can take a basic look into something extra chic. ALG encountered the wildest purses and bags around festival season last spring. We had a few clients that were wearing the most divine beading avocados with their cocktail dresses; I thought we have taken this hipster millennial avocado fascination a step too far yet strangely simultaneously coveted them. We additionally noticed intensely hued woven patterned cross-body bags popping up on every style maven’s Instagram account. After a wee bit of fashion stalking, ALG unearthed Hola Guava. Hola Guava is a wholesale and on-line based accessories company with products made in Colombia and other parts of South America owned and operated by Lauren Lipscomb. We finally caught up with this energetic entrepreneur whose disposition mimics her products. We are thrilled at where the company is headed and her thoughts on fair-trade fashion. ALG: Please tell us how you developed Hola Guava and how you uncovered these distinctive accessories. 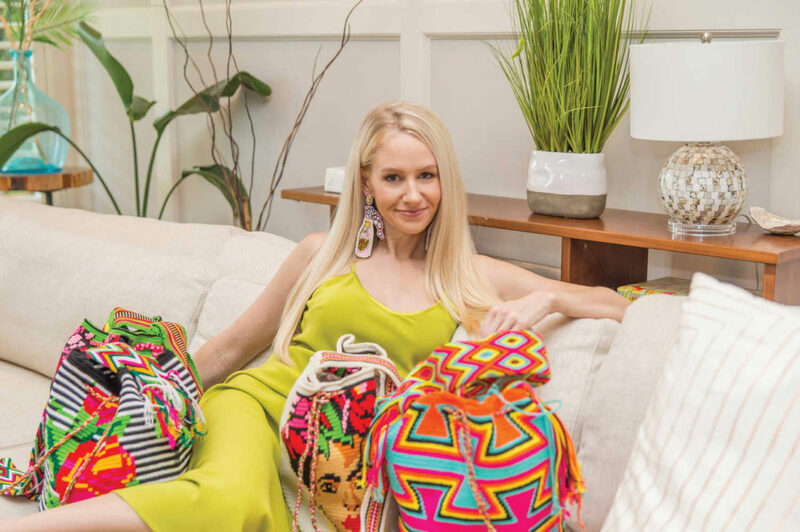 Lauren Lipscomb: On a trip to Colombia, I came across the most amazing bags and thought, “How can I get these to the United States?” Each bag is handmade by women and can take almost three weeks to complete. They are works of art, handmade with love and no two pieces are exactly the same. I delved into the world of jewelry and trends in South America, and, after a few trips, I started an Instagram page. Everything sold out in three weeks! ALG: Were you always interested in fashion and owning your own business? LL: My grandmothers were trendsetters and courageous women who were never afraid of taking a fashion risk. I definitely inherited that gene. I knew I wanted to start my own business but was not sure what direction to go. After my trip to Colombia and seeing the bags, I could not shake the idea of starting Hola Guava. I was meant to do this. ALG: How have you been able to keep up and gather your inventory? LL: Finding my products and choosing what to purchase has been the toughest part of Hola Guava. In the very beginning I did all the traveling myself, visiting different places, meeting a million people. I would go through hundreds of bags and pieces of jewelry to find one that was perfect and beautiful. I just do not have that time anymore; Hola Guava has grown and I have two babies. I had to find a more sustainable way to keep up with the demand. I now work with people in South American that are go-betweens between myself and the artisans. I also make it a priority that these women are fairly compensated. In addition, because of these budding relationships, I am able to have my own designs made. ALG: I am infatuated with so many of Hola Guava’s pieces — the bags and earrings especially. Do you have any favorite designs? LL: I have come across some truly amazing craftsmanship, but I may never be in touch with that woman again. I grow attached to the bags and it is sometimes hard to let go. Currently my favorites are the Frida Kahlo bag. It took years to locate artisans to complete the design. Frida was such a bold and brave figure, and I want Hola Guava to be a representation of those qualities. I am also obsessed with my Pop Art collection. They are a genuine statement earring. Clients are gravitating to French Fry earrings that say, “Fries not guys,” bedazzled Champagne bottles and over-sized evil eyes. ALG: On a personal level, how do you remain sane and balanced and what does the future hold for Hola Guava? LL: I have two young daughters, and I want them to see that you can have it all. I want to have my own business and I want to be a mother. I do not have to choose. The other day I was making jewelry, eating lunch and attached to a breast pump. Life is crazy, but you make it work. I look forward to creating and producing more of my own designs and expanding the jewelry line. The Hola Guava line will soon be found across the Gulf South from Texas to Florida. To find all of Hola Guava’s stunning creations, follow @HolaGuava on Instagram and visit holaguava.com. Be on high alert because these baubles sometimes sell out before they are even uploaded to the Hola Guava website. This fall season, embrace your inner Frida; be bold and brave; and wear Hola Guava! Make a statement.